Crappie, bluegill, pike, walleye: if just reading these names gets your heart racing, you’re probably headed for the ice as soon as it’s thick enough to support your weight. But as you know, freezing temperatures, wet line, deep jigging, and soft strikes present a set of unique challenges over the hole. 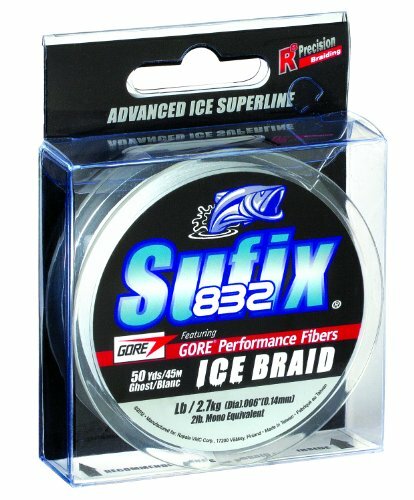 3.1 Sufix Ice Braid – Our Pick! 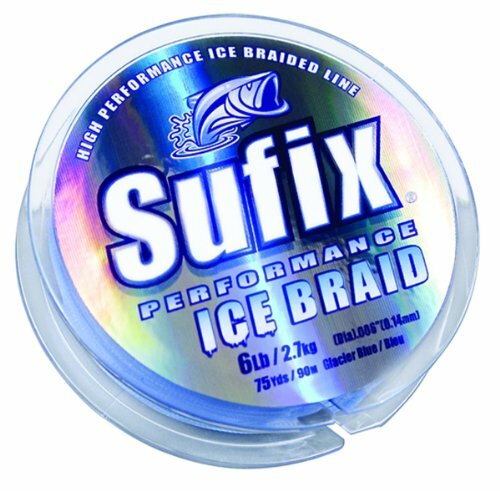 4 Our Pick – Sufix Ice Braid! As its name suggests, monofilament is composed of a single strand of what amounts to plastic. Easily the most popular choice due to its simplicity and familiarity, mono has a lot going for it. And while you’ll find plenty of superlines on the water in all seasons, there’s no need to feel unprepared if you choose the right monofilament. Castable – Mono is great for casting because it’s very limp. Low-visibility – Monofilament is easy to manufacture and easy to tint. As a result, it’s available in a huge range of colors to suit the water you fish. Floats – For topwater lures, this is a must. And with rigs that you want to fall slowly, mono is also a great choice. Knot friendly – Mono knots easily–an obvious plus. It’s simple to tie, generally forgiving, and takes pretty much any knot well. Stretch – Monofilament is the stretchiest line, and that has both pros and cons. Sometimes stretch is good, such as for preventing a fish from throwing a hook. It’s also an excellent feature when a line is suddenly shocked, allowing spring-action rather than failure. In fact, mono is the most shock-resistant of the three types of line. But in other situations, stretch is bad–such as while setting a hook when fishing deep. That stretch translates into less dynamic pressure on the hook, impairing your ability to set it powerfully. Weak for diameter – Compared to braid and fluorocarbon, mono is the weakest line at a given diameter. Low sensitivity – All that stretch translates into low sensitivity, a downside aggravated by more distance between your rod and lure. Essentially a monofilament line made from a different material, fluorocarbon has gotten a lot more popular recently. Initially too stiff for casting, it was used exclusively for leaders. But as the tech improved and it became supple enough for spooling, it’s now a popular weapon in the angler’s arsenal. Sinks – Fluorocarbon, unlike mono, does not float. That makes it unsuitable for topwater applications, but ideal when you’re fishing the bottom with worms or jigs. Strong – While not as strong for diameter as braided line, fluorocarbon displays really high tensile strength when compared to mono. Incredible abrasion resistance – This is another point in favor of fluorocarbon. It’s tougher and more abrasion-resistant than other types of line, and when you’re fishing on oyster beds or other rough structures, it’s the leader of choice. Some stretch – It stretches more than braided line but less than mono, making it a great choice for leaders on superlines. There, it can help act as a shock absorber and provide tough protection against abrasion. Mono is better in this capacity, but fluorocarbon has other strengths that make it a popular choice for leaders. Nearly invisible – Fluorocarbon is amazing in this respect. It refracts light much like the water around it, making it effectively invisible to fish. Waterproof – Fluorocarbon doesn’t absorb water–full stop. Memory – Because it’s relatively stiff, fluorocarbon has a bit more memory than mono or braided line. It ‘remembers’ the shape it’s forced into, meaning a bit more corkscrewing from spinning reels. Not knot friendly – That stiffness translates into poor knotting, and you must wet or lubricate fluorocarbon to get a knot to hold. OK casting – Fluorocarbon doesn’t cast quite as well as mono or braid–it’s just a bit too stiff. Braided line is exactly what it sounds like: a braid composed of multiple strands of really tough fibers. Sometimes braided line is heated to create a smoother, unified composition, as in Berkley’s FireLine. In other cases, it’s coated to resist water absorption. Unbelievably strong and sensitive, these superlines have become the go-to for millions of anglers. Super strong – Diameter for diameter, nothing comes close to the strength of braided line. Super castable – Ultra-thin for test, smooth, and limp, braided line casts really well, and many have moved to this line for long casting. No stretch – Braided line does not stretch, and that has advantages as well as disadvantages. Because it won’t give, it’s incredibly sensitive, especially when a lot of line is involved. That makes it excellent for hook setting, too. Sensitivity – Because it doesn’t stretch, it’s generally the most sensitive line. This is critical in cold water, when fishing with worms, or in any other situation in which you need precise feedback from the bottom and your lure. No stretch – While braided line’s lack of stretch has some advantages, it’s poor at absorbing shock. That can lead to broken line, even though braid is incredibly strong. The lack of shock-absorbing action can also allow fish to throw your hook more easily than with mono. Visibility and fade – Diameter to diameter, braided line is the most visible of the three and the hardest to color. Over time, many braided lines will fade, too. Gets wet – Braided line will absorb water over time, making it harder to cast. In cold weather, that water can freeze, too. Not knot friendly – While not as hard to tie as fluorocarbon, braided line doesn’t work well with just any knot. The Palomar knot, surgeon’s knots, and the ubiquitous Uni knot are all good bets. Abrasion resistance – Braided line can act like a tiny saw, cutting line, hands, and pretty much anything else. And though it’s great at abrading other things, it can’t take much of what it can dish out. It’s not very abrasion-resistant, which is why leaders are so often tied to connect the main line and the lure. Ice fishing places special demands on line, emphasizing the strengths and weaknesses of mono, fluorocarbon, and braided lines. We looked at the following special criteria to make our picks. Ice fishing doesn’t usually put the line in motion to the extent that w000arm-weather techniques do, and that makes the line easier for fish to detect. It’s imperative that ice fishing line be as close to invisible as possible. In this sense, fluorocarbon is king, with mono close behind. But in ultralight weights, braided line’s strength allows for tiny diameters, making it very hard to see line that would otherwise be visible. When the fight is on, fish are going to run your line against the ice. When they do, tough line is essential, as those sharp edges can tear at your gear. Fluorocarbon is the clear stand out, especially since a leader won’t help here. As the mercury plummets, your line will stiffen and become brittle. While this is less of a problem in a heated shed, cold weather will change your line’s behavior. Specially designed ice fishing lines are made to resist cold temps and remain pliable. As line absorbs water or carries it along its length, that water will build up on your rod’s guides. If enough ice forms, it can create a clog. Worse yet, wet, freezing line will stick to anything it touches, making it a real nightmare to handle. Here, mono and fluorocarbon are best, with braided line generally trailing. The best braided ice lines are coated to reduce water absorption, but they’re still more likely to ice and freeze. Cold water robs fish of their vigor, and sluggish nibbles are more common than rod-jarring strikes. When you’re jigging in 40 feet of water, you need all the sensitivity you can get from your line, and braided line is clearly superior here, with fluorocarbon close behind. Especially if you’re jigging with a spinning reel, memory can kill your chances. As the line ‘remembers’ the shape of your spool, it will kink and corkscrew, sending your jig twirling like a ballerina. Braided line and mono are better than fluorocarbon in this respect. You can’t have it all with ice fishing line, and some choices–and sacrifices–must be made. What are your biggest concerns and problems? Are you missing strikes? Is your line freezing and icing? Are you losing fish to abrasion? Are your knots giving way? Do you jig with a spinning reel, watching your line corkscrew its way into the hole? Diagnose your fishing ills and choose a line that can cure them. Sufix Ice Braid – Our Pick! Sufix Ice Braid is available in an enormous range of weights, so whether you’re after panfish or pike, they’ve got the line you need. We’d like to see more options on the light end, but even 6 pound test is remarkably thin in braided line. Available in two colors–natural tan and steel gray–we like the options, since they give us a chance to match the line to the water we’re fishing. Sufix applies an anti-icing compound to this braid, and it works pretty well. The line will ice, but simply passing it through the guides should shed that frozen coating without clogging your rod. It’s also very limp, and memory shouldn’t be an issue even on the tiniest spinning reels. Strong, no-stretch, and sensitive, this Ice Braid is ideal for deep jigging and when you’re after bigger fish. Like all braided lines, we recommend careful knotting. 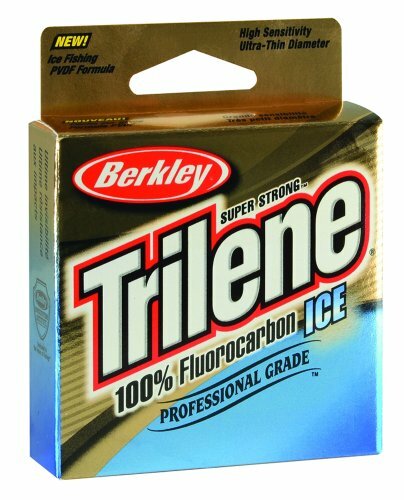 Berkley Trilene’s Fluorocarbon Ice is exactly what the name suggests: a 100 percent fluorocarbon line designed around the needs of ice anglers. This line sinks quickly, much faster than braid or mono, and it’s invisible to fish. These are serious advantages. It’s also really abrasion-resistant, as fluorocarbon should be. Available in 2, 3, 4, 5, and 6 pound tests, if you’re worried about visibility and want to crush crappie and bluegill, you could do a lot worse. However, the downside of fluorocarbon is evident with this line, too. Especially in heavier weight and cold temps, the Fluorocarbon Ice can get stiff and even threaten to unspool. That’s especially troublesome if you fish with an ultralight spinning reel, and we’d only recommend this line for in-line reels. Berkley Trilene Micro Ice is a monofilament line well-suited for ice fishing. While some anglers have moved away from mono, we see its advantages and recognize that it has strengths other lines don’t. This line has been engineered to reduce stretch, increasing sensitivity while still providing great shock resistance. Available in 2, 3, 4, 6, and 8 pound variants, you’ll find this line in two colors: clear steel and solar. Visibility should be fine, though not on par with light braid or fluorocarbon. While not up for real monsters like muskie, this line should be more than enough to land perch, bluegill, crappie, trout, and smaller pike and walleye. Especially in 2 pound test, this line is a real mono champion, demonstrating that the tried and true isn’t done. 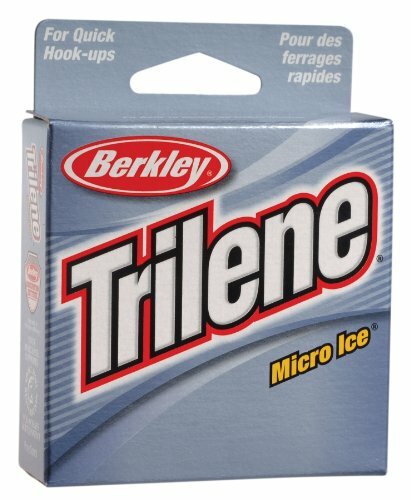 Like all mono, Berkley Trilene’s Micro Ice ties well. Whether it will display elephant-like memory depends in part on your spool size, how often you change your line, and temperature. Generally speaking, we find this mono to be pretty friendly for jigging. 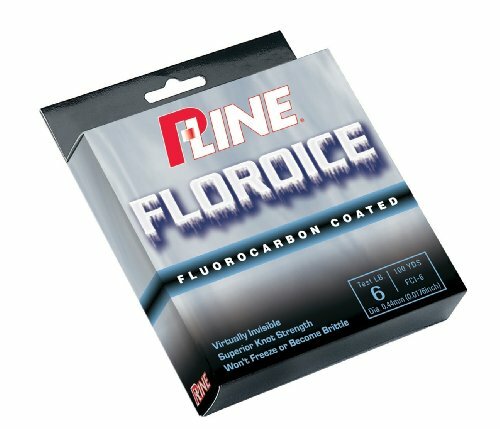 P-Line’s Floroice takes advantage of the strengths of both mono and fluorocarbon. In that respect, it offers a great combination of shock strength and invisibility. Those are both attributes well-worth considering, and it makes sense to highlight them with this unique approach. Available in standard mono weights–2, 3, 4, 5, 6, and 8 pound tests–the Floroice isn’t the best choice for bruisers. Instead, it’s built around the needs of perch and trout, bluegill and crappie, with occasional (or accidental) bites from small walleye and pike. Expect near invisibility from this fluorocarbon-coated line in all weights. Unfortunately, while the Floroice has the strengths of both materials, it has its weaknesses, too. Some stretch and reduced sensitivity are to be expected, and as the mercury drops, this line will stiffen. Icing can be an issue, so this line is best deployed from a shelter rather than when exposed to the elements. PowerPro Ice-Tec is braided superline coated with polytetrafluoroethylene (PTFE), rendering it less susceptible to water absorption. That’s a good addition, since wet, freezing line is one of the main issues we have with braided lines on the ice. Available in 5, 8, 10, and 15 pound tests, expect ultra-thin diameters and fantastic sensitivity. 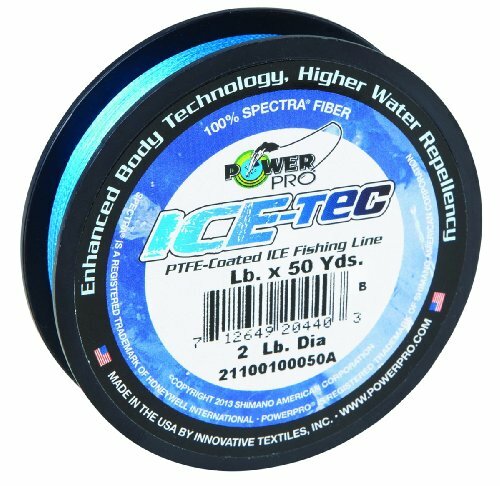 Ice-Tec is available in a single color–marine blue–but especially in the lower weights, diameters as small as .1 mm mean that this line will be hair-thin. That should make it all but invisible. As is usual for braided line, expect some knot issues. PowerPro recommends doubling the line for the knot whenever possible with your tackle, and of course you should lubricate the knot before tightening it as well. Remember that braided line can be tough on skin, so be sure to bring some pliers to cinch your knots down tight. Sufix 832 features a unique braided composition. One strand of a special fiber made by the material experts at Gore fiber–the makers of Gore-Tex–is interwoven with seven Dyneema fibers, providing exceptional strength and promising great water resistance. That promise isn’t always kept, however, and if you’re fishing unprotected on the ice, freezing can be an issue. But like all braided line, expect no stretch and great sensitivity from 832. Extremely limp, this line won’t remember the shape of your spool, making it ideal for jigging. Available in 4, 6, 8, 10, 20, and 30 pound tests, Sufix 832 is only offered in a single color, Ghost, which is essentially white. In lighter weights, this 832 is thin enough to be nearly invisible to fish. As with all braided line, be prepared for some knot issues, wet your line before tightening, and bring a pair of pliers to save your fingers. Our Pick – Sufix Ice Braid! Ice fishing is demanding, and generally, braided line offers some advantages for the winter angler. Ultra-sensitive, strong, low-memory, and hard for fish to see in lighter weights, high-quality braided lines have a lot going for them. But they have weaknesses, too, and water absorption that leads to freezing and icing is perhaps the most problematic. That’s why we really like Sufix Ice Braid. Coated to reduce water penetration, this anti-icing compound really works. At its best, this line has all the advantages of braided line, requiring just a touch more care when tying knots. That makes it a very good choice for ice fishing, and when you add to these strengths the incredible range of weights it’s available in, you can be confident whether you’re after crappie or muskie. While all of these lines are solid options, this is probably the best of the bunch.